Newsprint from Storefront for Art and Architecture’s 1988 exhibition, Project DMZ. Imagine the Korean Demilitarized Zone as a tiger farm or an airport, as an amulet for the reunification of the peninsula, or covered in a blanket of metal. 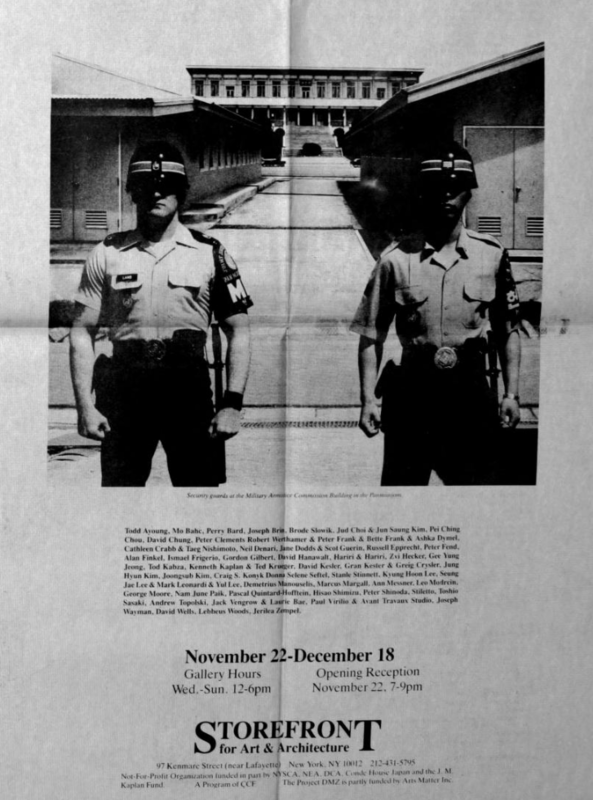 In November 1988, Storefront presented Project DMZ, an exhibition organized by Kyong Park and Cathleen Crab that imagined how the Korean DMZ might be occupied for non-military and anti-political uses. At the brink of South Korean democracy and right after the Seoul Summer Olympics, when it seemed almost possible that the DMZ could be the next geopolitical line to be removed, artists and architects such as Paul Virilio, Nam June Paik, Mo Bahc, and Lebbeus Woods proposed strategies for inventive use of the space, rather than for its outright elimination. Today, 30 years later, the political divide between the two Koreas remains. However, recent and dramatic political rapprochement between North and South Korea and the United States hint at the potential for radical transformations to take shape in and around the DMZ. Drawing upon Storefront’s extensive exploration of its own archival material, Project DMZ, 30 Years After brings together contemporary voices that address the DMZ in their own work and places them in conversation with works from the original exhibition in 1988. Together, participants will question the urgency and agency of art and architecture to build new visions that engage socio-political predicaments such as the political division of the Korean Peninsula. Through the study of the unique landscapes and architectures of the DMZ, Project DMZ: 30 Years After identifies borders as one of the most fundamental structures that function to define “us” and “them.” In the wake of this divide, participants will imagine new futures that better serve the commons. Project DMZ: 30 Years After is presented as part of the programming for Storefront’s current exhibition, State of Tyranny by Theo Deutinger, which examines the objects and spatial manifestations of tyranny both worldwide and locally in New York City. The event is also the first in a series of open archive events that Storefront will present periodically as part of its upcoming program, utilizing materials and documentation from the organization’s 36-year history of exhibitions, events, competitions, publications, and projects, in conjunction with the organization’s ongoing effort to arrange, digitize, and preserve its archive for broad public access. To learn more about Storefront’s archive, see here. The event also launches the publication Imagining Eurasia: Visualizing a Continental History by Storefront’s founding director, Kyong Park. Imagining Eurasia visualizes the historical precedents and contemporary reconstructions of Europe and Asia as one continent, envisioning a new relationship between East and West. The book highlights the significance of cities, networks, and territories within urban, regional, and continental geopolitics. Through his research, Park questions whether greater trade, migration, and cultural exchange bring about greater empathy and communion between different societies, or they instead deepen distinctions and result in conflict. The book also uses photographs, videos, graphics, animations, and texts to examine the constitution of points, lines, and areas that have morphologically shaped the space and time of Eurasia. Learn more here. Kyong Park is Professor of Public Culture at University of California, San Diego, as well as the founder and first Director of a number of institutions, including Storefront for Art and Architecture (1982–98), the International Center for Urban Ecology in Detroit (1998–2001), and the Centrala Foundation for Future Cities in Rotterdam (2005–06). Park has also served as curator of the Gwangju Biennale (1997), Artistic Director and Chief Curator of the Anyang Public Art Project (2010), and Project Director of Imagining New Eurasia at the Asia Culture Center (2015–17). He has exhibited at the Museo de Arte Contemporaneo de Castilla y León (Spain), the Kunsthalle Graz, the Deichtorhallen (Hamburg), the Kunst-Werke Berlin, and the Nam June Paik Art Center (Seoul). He is the editor of Urban Ecology: Detroit and Beyond (2005) and the author of Imagining Eurasia: Visualizing A Continental History (2019). Dongsei Kim is an architect, urbanist, and educator. He is an Assistant Professor at the New York Institute of Technology. His research examines nation-state borders across multiple scales that explore the ways we define “us” and ‘them’ through architecture and urbanism’s spatial “inclusion” and “exclusion.” His research on the Korean Demilitarized Zone and urbanism has been widely exhibited and published internationally in Topos, Volume, Inflection, Landscape Architecture Frontiers, and The North Korean Atlas. He contributed to the Golden Lion award-winning “Crow’s Eye View” exhibition at the 14th International Architecture Exhibition in Venice. He has taught at Korea University, Columbia University, Carleton University, RMIT, and Victoria University of Wellington (VUW). He received an MDesS (distinction) from Harvard University, MSAUD from Columbia University, and a B.Arch (honors) from VUW. Jungyoon Kim is the Founding Principal of PARKKIM, a Seoul-based landscape architectural firm, and a Design Critic in Landscape Architecture at Harvard GSD. She founded the firm with Yoon-Jin Park in Rotterdam upon their winning entry in the Taiwan Chichi Earthquake Memorial Design Competition (2004). She has also completed projects with diverse scales and landscapes, including Yanghwa Riverfront (2011), CJ Blossom Park (2015), SBS Prism Tower (2012), and Triple Street Shopping Mall (2016). Current ongoing projects include the H Zen Center in Chicago and Hyundai Motors Training Facility. PARKKIM’s work has been recognized widely by contemporary design professionals and thinkers. Kim and Park also collaboratively published a book called Alternative Nature (2016) the compilation of articles in various media since 2001. Kim received a Master of Landscape Architecture from the Harvard University Graduate School of Design and Bachelor of Agriculture from Seoul National University with distinction. Jinhyun Jun was educated in both fine art and landscape architecture, and brings exceptional attention to the perception of users in three-dimensional experience. He attempts to use diverse media, as he believes that both fine art and design can serve to renew people’s perspectives. Jun received a Master of Landscape Architecture from Harvard University and holds a Bachelor of Fine Art and Master of Landscape Architecture from Seoul National University. He is currently an Associate at Field Operations and a founder of Studio M.R.D.O. Jun has designed many diverse spaces and typologies, such as urban developments, theme parks, public parks, and gardens. Kangil Ji is a registered architect and co-founder of the design research studio DOH-GAM, founded with Namjoo Kim. While using his studio practice to investigate the relationship between environment, geometry, and human perception, he is concurrently working on higher education projects at Perkins+Will. He has won international design competitions including the Seoul Hall of Urbanism & Architecture (2015, for which he also was a lead-designer), Hongdae Culture Platform (2016), and Arch Out Loud (2017). He has participated in the Elements of Architecture publication and exhibition for the 2014 Venice Biennale. He is a member of the AIA and holds an M.Arch from Harvard University Graduate School of Design. Minkyung Song is an architect, urban designer, and researcher specializing in large-scale urban design solutions. Minkyung received a Master of Architecture in Urban Design from Harvard University and a Bachelor of Architecture from Yonsei University in Seoul. Before co-founding Studio M.R.D.O, she had worked on numerous interior design, architecture design, and urban design projects with renowned design offices including Kohn Pedersen Fox Associates; Skidmore, Owings & Merrill; and CAZA Architects. Minkyung also has been involved in research projects in Korea with AURI (Korea Architecture and Urban Research Institute) and LH (Korea Land and Housing Corporation). Youngkyu Shim is the founder and director of Project-DAY. He is also the Editor-in-Chief of GARM Magazine. He studied at Architectural Engineering at Hanyang University, and has been a reporter for the Joongang Daily Newspaper and Assistant Manager at SPACE Magazine. His research article on the DMZ, “A Flexible Expansion of Space to Resolve Conflicting Borders: The Demilitarized Zone of the Korean Peninsula” was published in the Journal of Territorial and Maritime Studies in 2014. Yehre Suh is an Assistant Professor of Urban Design at Seoul National University’s Graduate School of Environmental Studies, as well as Director of Urban Terrains Lab and the Office of Urban Terrains. She was the Curator of Asian Urbanism at the Asia Culture Center in Gwangju, Korea and has previously taught at Cornell University, Barnard College, City College of New York, and Pratt Institute. Suh’s research work focuses on the parallel urbanisms of North and South Korea. She is a registered architect in New York and New Jersey, and is a LEED AP BD+C accredited professional. She received a B.F.A. and an M.F.A. in Industrial Design from Seoul National University in Seoul, Korea, and a Masters in Architecture at the Harvard University Graduate School of Design. OPEN ARCHIVE: PROJECT DMZ, 30 YEARS AFTER is organized by Dongsei Kim, with research assistance and project management by Yisoo Choi. The event is based on ongoing research on the Korean Demilitarized Zone and original archive materials from Storefront for Art and Architecture’s 1988 exhibition, Project DMZ, organized and curated by Kyong Park and Cathleen Crab. PROJECT DMZ: 30 YEARS AFTER is supported by the New York Institute of Technology’s Institutional Support for Research and Creativity (ISRC) Grants. 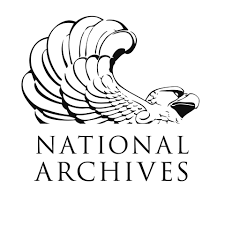 The digitization of Storefront’s archive is made possible by a major grant from the National Historical Publications and Records Commission (NHPRC). The archive has also received generous support from the Documentary Heritage Program of the New York State Archives, a program of the State Education Department; the National Endowment for the Humanities (NEH); the Council on Library & Information Resources (CLIR); and Mr. Robert M. Rubin.